Getting a healthy amount of protein and other nutrients can sometimes be difficult in the golden years, and certain foods seniors are used to eating are more detrimental than beneficial. 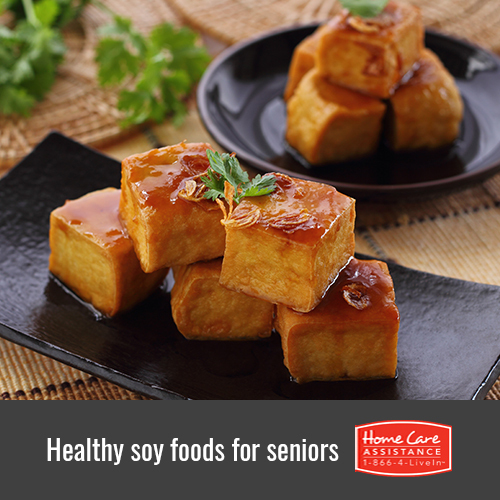 Soy, in its many variations, may be the solution your senior loved one needs to maintain a healthy and balanced diet. Harrisburg in-home care experts have a few suggestions for soy-based meals your loved one can try. Soy is a mainstay of the traditional diet in Okinawa, Japan, which has one of the highest life expectancies in the world. Researchers studying the Okinawan diet believe the isoflavones in soy may help slow bone loss. Soy also contains high amounts of natural estrogens, which some studies suggest may combat hot flashes and breast cancer. This classic Japanese meal actually has a double dose of soy: the broth is made from miso, a fermented soybean paste, and the soup has chunks of tofu floating in it. As people age, they often have a harder time digesting traditional sources of protein like meat and beans. Fortunately, processed soy products like tofu are typically easy to digest, making them a great source of vital protein for the elderly. A tofu smoothie is a nutrient-packed breakfast that’s easy on the stomach, and regular consumption of tofu and other soy-based foods can help reduce memory loss associated with aging. Tempeh is often overlooked in America, but this chewy soy protein has a meatier texture and more flavor than tofu. This ratatouille is a protein-packed spin on a classic French dish that substitutes tempeh for the classic eggplant. Simmering the ingredients in vegetable broth fills them with deep, slow-cooked flavor. Satisfying dishes like this can help lower cholesterol if eaten in place of meat-based meals. When used as a meat replacement, tofu can be marinated to pack it with flavor, then grilled and served on a burger bun. The protein in this meal can help build muscles and help fight the loss of strength often associated with old age. Home Care Assistance considers nutrition one of the most important factors of a senior’s health. Among other healthy lifestyle choices, our proprietary Balanced Care Method focuses on maintaining a healthy diet. We are a leading provider of Parkinson’s, stroke, and dementia care in Harrisburg, and our caregivers are available 24/7 to help with meal prep, take care of grocery shopping, and assist with a wide array of other tasks. For more information on our elderly care services, call one of our experienced Care Managers at (717) 540-4663 to request a no-obligation consultation.